FILL, Swirl, Shake, Drink & Recycle. With whey protein isolate as the first ingredient of the whey protein blend, Enduraphin Whey Protein quickly aids in effective muscle recovery. 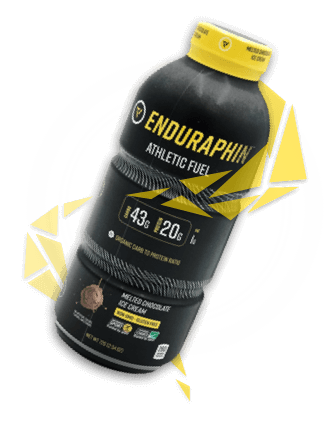 With over 40 grams of organic complex carbohydrates and 20 grams of fast-digesting whey protein, Enduraphin Athletic Fuel supports glycogen level restoration and muscle recovery. No need to worry about harmful artificial ingredients. We use natural ingredients to create great tasting, yet effective products. Each product contains a high-quality whey protein blend with whey protein isolate, whey protein concentrate and hydrolyzed whey protein isolate. With our patent pending PHINTECH, say goodbye to dirty shaker bottles and low quality Ready To Drink Shakes. This dual blade system was engineered to perfectly blend your protein shake. Simply swirl, fill, swirl, shake, drink and recycle! When consumed within 30 minutes of a strenuous activity, our products were developed to aid with muscle recovery. A recovered athlete is one that can get back to work! Whey Protein was developed for athletes' consumption post-lift to get 25 grams of high quality whey protein into the body. Athletic Fuel was developed for strenuous lifts, practices and games to help restore glycogen levels, with over 40 grams of organic carbohydrates, and help stimulate muscle recovery, with 20 grams of high quality whey protein.